Holidays are wonderful. Not only do you have your family and friends around you, but you get to make your home festive too. To show others your creativity and holiday spirit. In this case, with Halloween coming up, it’s your Halloween spirit (sounds spooky right?)! Well, the truth is we are adults now and we want our homes to represent us the best way possible. We don’t want any decorations that would be too scary and unwelcoming. Yet, we still want to get into the spirit of things and enjoy the holidays. If you have kids or even if you don’t you also don’t want your front porch, door or yard to look like something from a bad B movie or a cheesy kid inspired Halloween land. You want something tasteful, elegant and something that says “we love holidays and Halloween, but we are modest, modern, and welcoming!” I have good news for you! 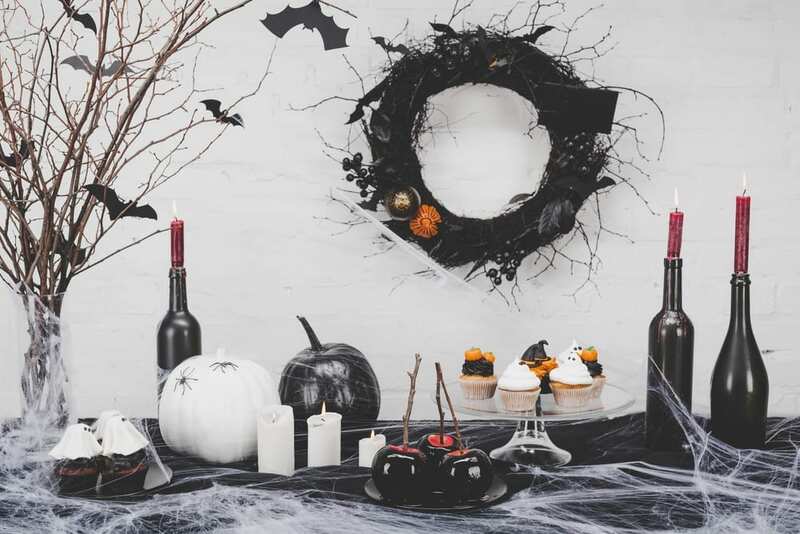 There are some great and tasteful decorations for Halloween that will delight and welcome all of your visitors, but not be too scary or too cheesy. Here are some of the best ideas for elegant outdoor Halloween decorations of 2018! Pumpkins are always a big part of Autumn and Halloween. This elegant décor for your front porch or outdoor area isn’t only elegant and easy to do, but it works for the whole season. You don’t have to label it 100% Halloween décor because it can be used for both. Monochromatic pumpkin theme is one of the most elegant pumpkin decors you can do. Most people pick white and bonus points for those who make Jack-o-lanterns out of the white pumpkins to place aside the solid white pumpkins as well. It can be one of the easiest and most elegant pumpkin decors you have ever done if pulled off correctly. You can even add a pop of color with some squash next to the pumpkins. Either way this it top of the list! Spider webs don’t have to be scary. In fact, they can be quite elegant if done right. Highlight your spider webs with beautiful flowers (fake or real) or put a few white lights with them. You can even match this look with the white pumpkins without it looking gaudy or overdone. Plus, spider webs are easy to find and easy to put up as well as take down after Halloween is over. Whether you have a huge wrap around staircase in front of your home or just a few steps you can put different sizes of pumpkins in a line from the top of the front porch all the way down your stairs to the sidewalk or to the driveway. Start off with small pumpkins and have the pumpkins gradually get bigger as they head toward the end of the steps. You can put one small pumpkin. Then two medium sized. And so on and so forth until you get to one giant pumpkin or a giant with a few medium-to-small pumpkins. A vintage or rusty looking wreath with a few hints of spiders, bats or mini pumpkins can really make your front door stand out. Wreaths are wonderful, but what’s even better is an old or vintage looking wreath. It gives people a semi-spooking feeling, but it’s still elegant and not too much. It will give the right vibes and not have people running back to their cars. Here is a tutorial on a do-it-yourself Halloween wreath that won’t cost you a ton of money Add your own flare and be creative with this. Also if you want your wreath to look rusty or have that vintage feel that makes it elegant you can learn how to make objects look rusty here at this tutorial. Candles or candlesticks lining your porch and/or door. There is nothing more elegant than candles or candlesticks. This is true at any time of year or for any occasion. Make it more Halloween fashion with black candles or other Halloween inspired colors. You can get some white candles and candles stick holders then add “blood” red drips down the candles. Again, scary, but not too scary. It will look esthetically perfect. Check out how to get the candlestick blood look without breaking your bank here. Twinkling lights aren’t just inexpensive, but magical. They can make you feel like you’re in a different place entirely. Get pumpkin-shaped or orange lights and line them on your door or around your door. You can wrap them around your stairs as well to add some extra Halloween inspired flare. Then add the twinkling lights in little candle holders around the base of your porch or stairs. Lights make everything better, but the twinkling lights will add an elegance you would have never thought of. The best part is you can have these out all season long and they won’t look cheesy or out of place. You can buy holders on Amazon for around $17.00 that will look elegant and give you that Halloween feels still. Check them out here and please not twinkling lights sold separately.